Julie Boerio-Goates and her husband, Steve Goates, of Orem, Utah, have been married for 42 years. Julie is a committed Catholic who is active in diocesan and parish ministries in the Salt Lake City Diocese, and Steve is just as active in the Church of Jesus Christ of Latter-day Saints. OREM, Utah (CNS) — For Julie Boerio-Goates and her husband, Steven Goates, dialogue between the Catholic Church and the Church of Jesus Christ of Latter-day Saints is a very personal thing. 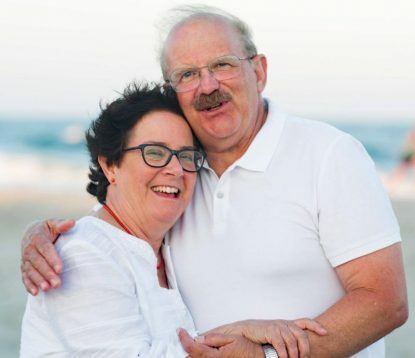 Married for 42 years, the two have had to navigate a host of issues as Boerio-Goates is a committed Catholic and Goates is an active Mormon. A member of St. Francis of Assisi Parish in Orem, Boerio-Goates for many years has been involved in parish and diocesan ministries. The pastoral coordinator for her parish, she most recently was an adviser on the Diocese of Salt Lake City Pastoral Plan. Prior to that, she was a chemistry professor for 32 years at Brigham Young University, the Church of Jesus Christ of Latter-day Saints’ private university. Steven Goates, who is a chemistry professor at the university, has held many leadership positions in his church locally and also has been very involved in the Scouting program of the Latter-day Saints. While the two worship separately, each helps the other out with their church responsibilities when they can. The relationship has been rewarding but also very challenging as they have learned to navigate the role of the two faiths in their marriage, they said in an interview with the Intermountain Catholic, Salt Lake City’s diocesan newspaper. “We started with the idea that we weren’t going to try to change the other person; I think we both had hopes in the beginning that the other person might change religions, but we decided that wasn’t going to be a primary goal,” Goates said. “We decided we had to go into the marriage with a love for who the person was, as they are now, with the stance that we would be happy as long as they continued that way. Our happiness was not going to be predicated that sometime in the future they would ultimately convert,” Boerio-Goates added. A few years after their marriage, the couple settled in Utah County so they could both teach at Brigham Young University. Over the years, the family was generally accepted in the community, but they said there were occasional hurts and insensitivities from members of both churches that were particularly hard for their son and daughter, who grew up exposed to both faiths. Ultimately, their children, who are now adults, have not remained active in either faith, something they are aware many modern parents deal with even when they both attend the same church. While these days the relationship has a “reservoir of joy,” as Boerio-Goates described it, it has been hard-won. They admit there is a loneliness as each attends church and practices elements of their faith without the other, but they have found a way to make it work. In the greater community, the couple now see an increased willingness by members of the two faith communities to reach outside their different beliefs to find common ground. “There are more LDS people that look as Catholics as allies rather than competitors these days,” Goates said. Petersen is on the staff of the Intermountain Catholic, newspaper of the Diocese of Salt Lake City. NEXT: What on earth is a ‘social justice hackathon’?